Save 50% off regular prices! Show the many important ways African American scientists have contributed to modern scientific discoveries using an easy-to-implement timeline project, an engaging webquest, and 5 biography readings with worksheets. 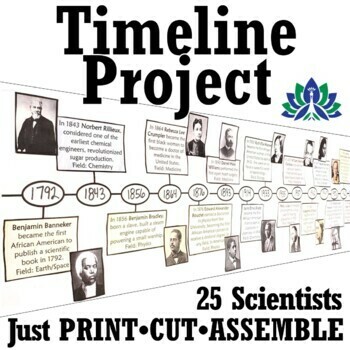 African American Achievements in Science TIMELINE PROJECT: PRINT AND GO! 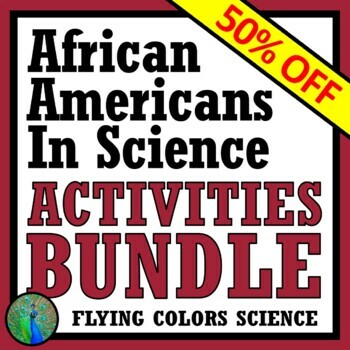 Everything you need is included for students to assemble an African American Achievements in Science timeline or bulletin board. Two versions are provided - Version One requires students to research 20 scientists themselves and Version Two gives students 20 pre-made biography cards. The only supplies necessary are copier paper, glue and colored pencils. First students create a timeline by taping or gluing together the provided timeline templates (4 pages) to create a meter-long timeline. Then, students color code the 20 provided "biography boxes" according to the field of science represented by the scientist (biology, medicine, Earth/space, chemistry, or physics). The biography boxes are attached to the timeline, and students enter the appropriate dates. Finally, students add pictures (provided) to each of the entries. Valerie Thomas, NASA Astronomer Biography & Questions: Valerie Thomas lead many important programs at NASA, especially those related to satellites. She is best known for her invention of the illusion transmitter, the precursor to today's 3D technology. In this assignment, students read a 2-page biography about her life and scientific accomplishments, then answer 10 text-dependent reading comprehension questions related to Thomas' scientific work. Vivien Thomas, Cardiology Pioneer Biography & Questions: Vivien Thomas played a vital role in the development of several life saving surgical techniques, including surgically correcting blue baby syndrome and implanting automatic defibrillators. Despite decades without proper recognition, his work has implications across modern cardiology. In this assignment, students read a 2-page biography about his life and scientific accomplishments, then answer 10 text-dependent reading comprehension questions, some of which focus on the major steps of the scientific method that can be seen through Thomas' work. Dr. Marie Maynard Daly, Chemist - Biography & Questions: Dr. Marie Maynard Daly was the first African Amerian woman to earn a PhD in chemistry, and her remarkable work as a chemist has had implications for the understanding of the structure of DNA, gene expression, and cardiovascular health. In this assignment, students read a 2-page biography about her life and scientific accomplishments, then answer 10 text-dependent reading comprehension questions. Percy Julian, Chemist - Biography & Questions: Percy Julian played a vital role in developing easier and cheaper ways to extract steroids from plants, making these life-changing medicines, such as cortisone, available for millions of people. He also developed fire extinguishers still used on aircraft carriers today. Despite decades without proper recognition, his work has implications across modern chemistry. In this assignment, students read a 2-page biography about his life and scientific accomplishments, then answer 8 text-dependent reading comprehension questions. Dr. Jane C. Wright, Cancer Researcher Biography & Questions: Dr. Jane C. Wright revolutionized cancer research, and her work has had implications for cancer treatment to this day. 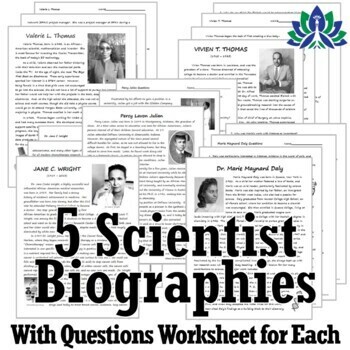 In this assignment, students read a 2-page biography about her life and scientific accomplishments, then answer 10 text-dependent reading comprehension questions focusing primarily on the major steps of the scientific method viewed through Dr. Wright's work. 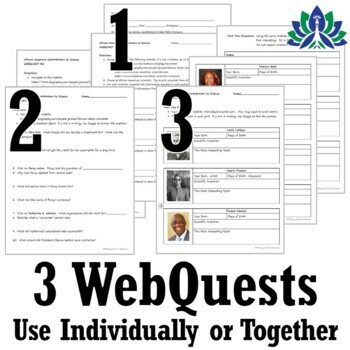 African American Contributions to Science WEBQUEST: This internet activity has 2 parts that can be done completely independently of each other, or at the same time. Part One (Open Ended): Students are given 4 websites and look through the sites to research 6 scientists of their choosing (there are hundreds to choose from). To close Part One, students discuss what they have read about how scientists overcame adversity and prejudice. No answer key is provided for this part because the options for students to research are too wide-ranging. Part Two (Specific Questions): Students are given one specific website with questions that relate directly to specific scientists. The focus is on the wide-ranging fields of science that African Americans have contributed to, and highlights some specific major accomplishments. This part of the webquest is much quicker than the first, and would be great as a homework assignment. An answer key is provided for this part! *Plus a free bonus resource "Honor MLK Jr. In Science Periodic Table Activity"
Search all of our NGSS-Aligned middle school materials in Our Store! Easy to follow, effective, and always standards-based!